About: Hey there, Lullaby here! Appearance: Annie is a very doggish hybrid, taking more after her domestic roots than her wild ones. 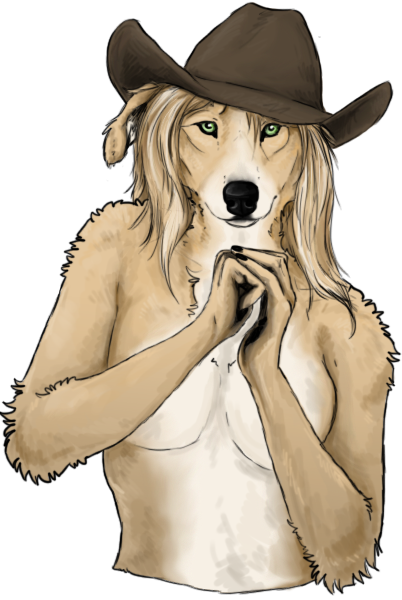 She is both colored and feathered much like a golden Labrador retriever, more often than not she is wearing an old hat of her father's that is too large for her. She often wears an expression of nervousness and uncertainty, never truly looking you in the eyes. Please note, Annie is completely deaf in her left ear and partially deaf in her right. Personality: Annie is an anxious individual with a very low self-esteem. Being partially deaf exacerbates this problem, leading her to criticize herself for not being able to accomplish tasks as easily as others. She is not introverted in the true sense of the world -- she wants to be around people and feels recharged when with them -- but can most often be found alone due to her social anxieties. She assumes the worst of what others are thinking of her, which becomes a self-fulfilling prophecy; she alienates herself and so is seen as stranger than she really is, leading others to tease her. Due to her anxieties, she is flighty and prone to rash, panicked decisions. Biography: Annie McCoy is the daughter of Wayne McCoy and Chevelle Dallas, born in the southwestern States and raised a horse wrangler and medical helper. At a young age she decided to strike out on her own, due to anxity and self-alienation, thinking she was a burden to her family. She started for Nova Scotia but got lost and ended up taking longer than planned, luckily she was found by a gypsy willing to point her int he right direction.